I’ve arranged pretty much everything for Karlsruhe. Meaning: transportation (train) and the hotel. According to the feedback I received, the public transport will be pretty terrible during the conference. So make sure to get a hotel nearby. The one I chose (Leonardo Hotel) is about 20 minutes walking. Make sure to read the reviews of this hotel. 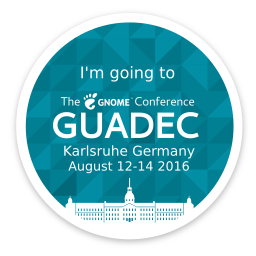 The closest hotel will be Achat and the GUADEC website should soon have a discount code for that. Achat with discount is still more expensive than Leonardo; though Achat should be worth it. Aside from the likely non-working (UPDATE/correction: mostly working except maybe 1 tram line) public transport, they’ll also have bikes for around 1 EUR/30 minutes. So that’s probably what I’ll use to get around. The bikes likely require a data connection to rent. To get there I’ll go by train; seemed like the best option (100 EUR round trip for about 6 hours one way). Coach would take 8+ hours and cost at least 100 EUR. Anyone looking into doing the same I recommend booking asap, trains are getting more expensive. I gambled on not paying the additional 8 EUR to reserve a seat on the high speed train part. Let’s see if that was a wise choice Still remember the time I reserved and the train was pretty much empty, as well as the time I did not and I had to change seats multiple times! Public transport should be fine in general. There is some construction work (ongoing for years now) which means that one of the 3 north/south connections is blocked (the middle one connecting main station with market square). However, other than that the tram system is working well and most tram lines go past the campus (stop around 650m away, or even closer). So as long as you are not at staying close to the one closed tram line, you are likely to be get a direct connection to the campus (even from close by towns!). Oops. That’s what I heard, but I’m not organizing it at all. Maybe it is only the tram line near my hotel? What makes you think that? I live in Karlsruhe and – despite the construction sites – public transport is running as usual and for a city of that size very extensive.